But no need to lose your zen.. I went ahead and gathered THIRTY SIX delicious vegan DESSERTS that you can make for mom this Sunday! All recipes included in this round up are Vegan, OIL free, and Refined sugar free. Some are even completely raw vegan and gluten free. Choose from elaborate cakes to simple cookies - there are plenty of options. Make this Mother's Day a healthy one for mom, because you love her. A special thanks to all of the food bloggers who contributed their recipes and images for this round up! If you like what you see - please don't forget to SHARE the love. Not your typical sugar cookies - these are made with CHOCOLATE! Mom's favorite 😉 Plus the pretty pink frosting on top is perfectttt for the occasion. If spring has sprung on your side of town - make these beautiful and refreshing colorful pops for mom! The title of this recipe basically says it is. It's cookies! It's topped with blueberry whipped cream. It's delicious. Surprise mom with this adorable vegan treat. I can't even deal with how gorgeous these tartelettes are. They are tropical and full of rainbow vibes! Now you can have apple crumble and doughnuts in ONE. Genius! A fool proof way to make the tastiest and melty-esttt fudge ever! Only five ingredients plus a bit of salt! Stun the mamas in your life with this super elegant looking gorgeous cake by the Unconventional Baker. The best part is - NO baking required! Healthy clean ingredients that'll make moms say YUM. A perfect combo of raspberry and mangoes! The Vegan8 does it again! Amazing pecan pie in COOKIE FORM! So much yes! If mom's favorite color is green, check out this beautiful cheesecake that's made with nothing but goodness. You can never have too much chocolate on your mother's day menu! These brownies, made with almond butter, are SURE to wow the special mamas in your life. I can only imagine how good these baked apples taste, and smell! Surprise mom with a healthy and sweet treat! A twist to the traditional cheesecake pie, served as slices instead! Coconut fruit wraps are the perfect breakfast or brunch menu item. Healthy, colorful AND fresh! Holy moly, just the golden color alone of this bread is GORGEOUS! Plus, you add the benefits of turmeric and you've got yourself a beautiful golden super-food for your super MOM! Bet you never thought you could eat hummus as dessert! You can't go wrong with brownies, and these are a healthy and tastier alternative to the traditional kind. Plus, they've got raspberries which make everything look prettier! If you're all cookied out - try these dough bars instead! Chewy peanut butter cookies that only require five ingredients plus a pinch of salt. Moms love chocolate. Make your own with this fudgy tasty recipe! If you're having breakfast or brunch with mom, this one is a winner. Not only is it a breeze to make, but it's also so pretty to look at, and most importantly TASTY! Adorable carrot cake in mini cupcake form! This cake is gorgeous! Top it with some date caramel and it's the perfect dessert for mama! Just seven ingredients + a pinch of salt makes these a perfectttt sweet treat for Sunday! The easiest sweet recipe you could ever make - just THREE ingredients and they're NO bake! More time to spend with family, less time cooking! Dreamy chocolate chip cookie dough bites with superfoods such as walnuts, hemp seeds, and even red lentils! We can't have a spring mother's day round up without a strawberry rhubarb recipe now can we? If simple is the name of your game - then try these amazing tahini truffles. Super simple and so decadent. Surprise mom with brownies made out of black beans - but maybe tell her after she takes the first bite. 😉 She'll be shocked at how good healthy food can be! These have so much goodness going on. Vanilla and Chai put together into one delicious blondie! And only THREE ingredients!!! Make mom a breakfast-in-bed this Sunday, and make sure to include this chia parfait on your menu! If you're looking for something light and sweet, try these mini lemon cheesecakes! This is another simple recipe that is sure to amaze the moms! They won't believe you when you tell them it's healthy! Dates stuffed with a sweet tahini butter mixture and then coated in chocolate. Delightful! If mom's a peppermint fan, you've got to make these for her. There you have it foodie fam. 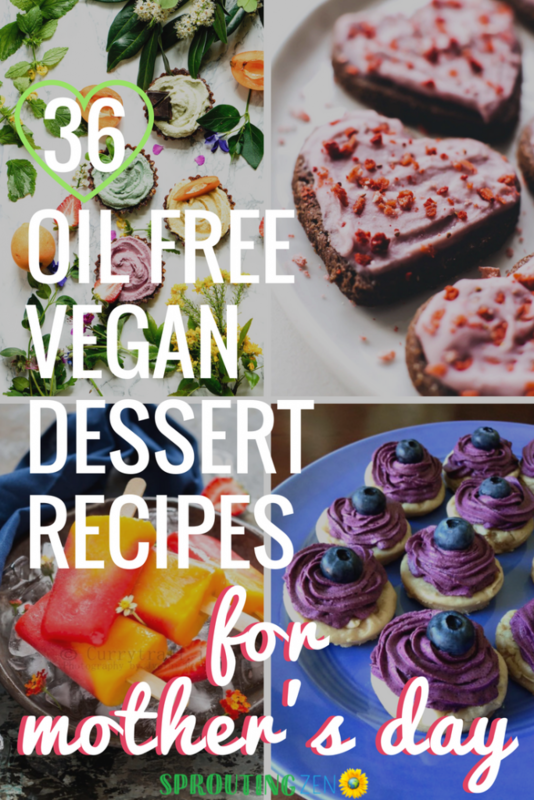 Thirty six unbelievably creative vegan recipes that are free from refined oils and refined sugars - and perfect for mom. Whether you're making her breakfast in bed, brunch, lunch or dinner - I am almost certain you can find a yummy dessert to include for Sunday's menu. If you're still on the hunt for gifts - check out this blog post I wrote where I share 10 last minute zen gift ideas for mom. I’m drooling! 🙂 So many delicious desserts, I don’t know where to start. Thank you for including our Brownie Batter Hummus! Sharing!